This year (Academic BEtreat 2012 ) the value creation framework has again been a topic for discussion, with the added advantage of having a few participants who are using it or planning to use it. It was a useful discussion, which has further informed my thinking and practice; I am currently working on a project in which we are using the value creation framework to inform our approach to knowledge management in a third sector organization. There has been a tendency (at least in my mind) to confuse value creation with evaluation. The term evaluation is not helpful in this context as it brings with it notions of assessment. I say this despite the fact that both the words ‘evaluation’ and ‘assessment’ are used on the Wenger-Trayner website. 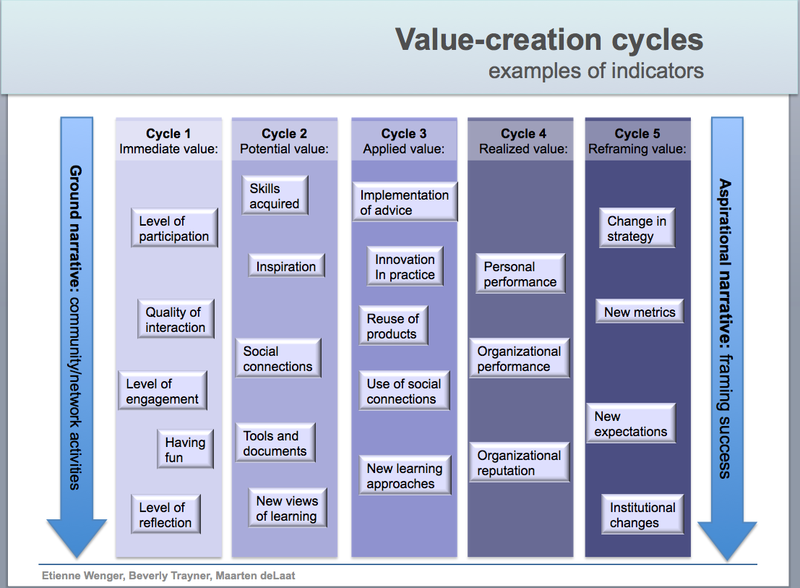 The focus of the value creation framework on storytelling and indicators of value creation (a matrix of indicators and stories) is designed to explore what counts as value in a community of practice. The matrix is the key element of the framework. 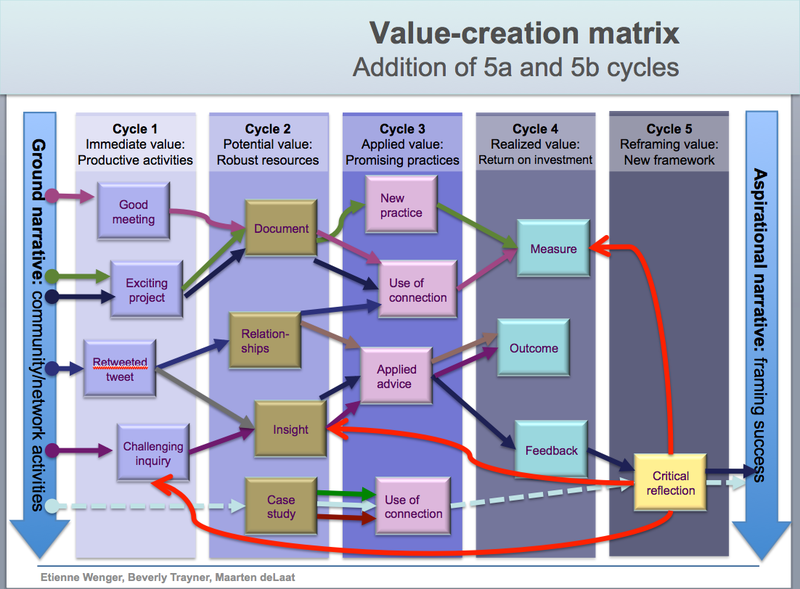 Whilst some quantitative data is collected through the use of the value creation framework (e.g. website statistics as an indicator of immediate value in Cycle 1), much of the framework focuses on collecting qualitative data though story telling in answer to questions such as ‘What activities have you participated in and how has this participation changed your practice?’ or ‘What were the key things that happened that made a difference?’ Stories answer the ‘so what’ question. My perception is that the process of collecting stories is not that easy to manage, unless it is part of a research project and the stories can be collated and analysed by a research assistant. Analysing stories is a skilled job and begs the question of who will do this in an organization without a researcher. A number of stories will be needed to validate value creation at a collective level and this will generate a lot of data. It will also require a lot of ‘man hours’, since the story collection process will ideally involve 3 people – the person telling the story, the person responsible for drawing the story out, and the recorder. Value can of course be collected at the individual level, but this is unlikely to impress stakeholders and funders. We need to convince stakeholders and funders and maybe even the senior management team that story telling is not just ‘qualitative fluff’. 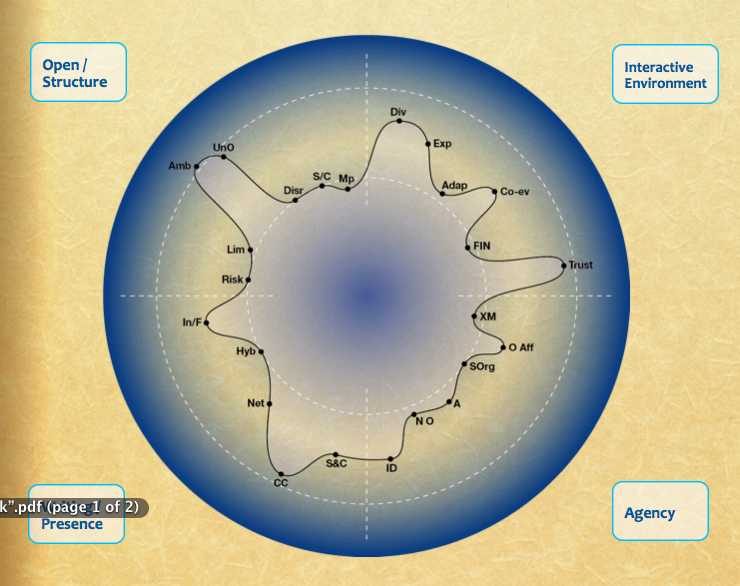 The value creation matrix combines qualitative and quantitative data with causality trails between indicators. The only people who know and understand the causality links are the storytellers themselves. Thinking of stories as causal trails is more likely to lead to rigorous analysis of the stories. Stories can also be about ‘lack of value’ and these will be just as valuable. Negotiation of indicators is critical to the success of the value creation process. In the negotiation of indicators stakeholders should clarify why an indicator is important. The following two stories illustrate why the negotiation of indicators is important and how inappropriate use of indicators can be misleading. Surgeons in New York were graded on the mortality rate of patients – but knowing this, surgeons would aim to achieve a high grade by turning away patients they couldn’t save. Russian shoe-makers were graded on the number of shoes they could make out of the least amount of leather. They responded by focusing on making Size 5 shoes which led to a shortage in larger sizes. The value creation framework should be adapted to suit different communities of practice. Indicators of value creation may be unique to the community. The framework should hopefully become a tool for reflection both at the individual and collective level – a dynamic tool for reflecting on learning capability and optimizing learning. The number of case studies of how the value creation framework is being used appears to be increasing. The next challenge will be to prove to funders and stakeholders, through the analysis of the stories/data, that the time spent in applying the value creation framework has been well spent. In preparation for the Academic Betreat 2012 , we have been asked to read a number of chapters from Etienne Wenger’s book, Communities of Practice: Learning, Meaning and Identity. I have just read Chapter 4: Boundary (p.103 -121) and Chapter 5: Locality (p. 122 – 133). I have heard Etienne speak about landscapes of practice before, most notably last year at Lancaster University – I blogged about it here – but reading these chapters adds some new dimensions to my thinking and understanding. If, as is written on p.107 ‘A boundary object is not necessarily an artifact or encoded information’, it occurred to me that the BEtreat itself might be considered a boundary object and the participants might be considered to be ‘brokers’. ‘Brokers are able to make new connections across communities of practice, enable coordination, and – if they are good brokers – open new possibilities for meaning.’ Who will emerge as ‘brokers’? Will we all be ‘brokers’ or just some of us? What skills are required? have enough distance to bring a different perspective, but also enough legitimacy to be listened to. My experience is that the last point is not always easy to achieve. Will we see different types of boundary encounters in the BEtreat (a one-on-one conversation between two participants, immersion through visiting the practice of one participant, or delegations)? Will the BEtreat keep the insiders in and the outsiders out, or will we be inviting outsiders in and working across boundaries ourselves? Is this realistically possible in such a short period of time where the activity will be very intense? What do we mean by insider and outside in this context? Do brokers necessarily work on the periphery? So will the Academic BEtreat be a community of practice or simply a course? It seems to fulfill many of the criteria of a CoP. What would prevent it from being a community of practice? Does it matter anyhow? What will be our experience of landscapes of practice in this BEtreat?